Enjoy hours of calming inspiration with the classic tile matching game of Mahjong. "This game provides hours upon hours of enjoyment. Mah Jong Medley has four separate modes of play, with hundreds of different games to play -- some easy and some not so easy. These games are for young and old with easy to understand instructions." Choose from over 300 Mah Jong layouts, all distinctly original, ranging from super easy to extremely challenging. Plus there are four exciting ways to play. Play like you've always played Mah Jong Solitaire in Classic mode. Select two tiles that add up to ten in Ten mode. Move up to two tiles out of the way in Free Cell. And rearrange tiles in numerical order in Addiction mode. 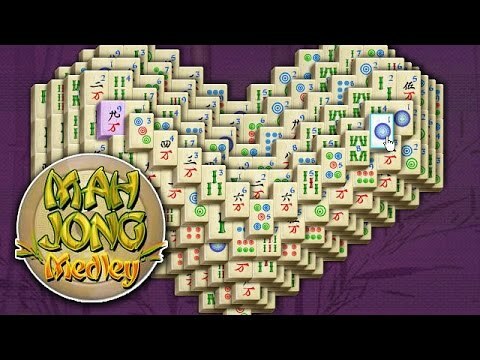 Enjoy hours of calming inspiration in Mah Jong Medley. Mahjong medley is a great game, but beware, it is addictive! There are 4 different games and many many variations within each game. It is well worth the money. I like all four of the Mah Jong Medley games. They can be tough but that is part of what makes it fun! This game is challenging but not impossible. With so many layouts, it's the best I've found. Love it! Quite a good game with an attractive set up and lots of clear and easily distinguishable tiles. The selection of tiles was good and the time clock was placed so it became part of the game and not just an add on. Absolutely love this game. Lots of variations, layouts, tile selection. Trying to master each layout with different tiles. It keeps me playing for hours, even staying up until 2-3 am trying to master each one. This game can keep you entertained for hours! I like that it's not one game but it's an assortment of all different types of games. Mah Jong Medley is my favorite on line game and I have spent hours playing it. I find this game totally relaxing. I have played this game for years. Lost it with the Window 10 upgrade. So glad to have it back. Life is good again. The game was challenging and could finish the game and not get locked with no more moves. Nice twist on the classic Mahjong.